I have been navigating between two seas inside of myself: happiness and challenge. The group is bigger, from 24 to 53 young people. From 2 nationalities to 19 different ones and the OT’s group doubled. Therefore, it’s all new again! Among so much new, my insecurity has shown more. So have my fears. I’m afraid of not being good enough, of not giving my best and of having still so much to learn (which is actually something really good). I’m also afraid that among so many people and so many things, I won’t be able to be myself. However, all these hunted feelings have a good side. They have made me realize my strength and use it to keep myself firm and focused and at the same time be open to live with presence each moment from this experience, which has been like having the whole world in the backyard of my house. I feel connected to the whole world, being able to know new cultures, customs, languages and different ways of acting and being. The energy is very different and a new cycle has really been anchored in the program. On our first Saturday night together, we made a bonfire by the river and under the starry sky. Simon, one dear YIPie from Belgium, infected everyone that was there with his enthusiasm and spontaneity. He made us stand up around the fire, sing in French and in Russian, dance and move our bodies. This unique moment and energy when shared fulfils my heart and soul. Every morning we start the day punctually (I’m loving the European culture) at 08:45 singing together, something usual to YIPies but new to UNIs. Everyday each new song gives me the chills, it’s like I’m washed with a magical energy and I owe it to this beautiful group of people. I will sum up these first days of YIPUNI with the word OPPORTUNITY, because I feel a space for knowledge, connections, expansion and evolution is being created. We are in total 61 people (53 participants and 8 OT’s) sharing, opening up, learning and teaching. One afternoon as I was walking a trail on the way home, a YIPie held my hand and asked how I was feeling. In such a dear and simple gesture I felt the whole world vibrating more. Yes, the backyard is full, and so is my heart! It’s been three weeks, living our new life in Piracanga. At some moments, it feels like the contrast between Sweden and our Brazilian bubble couldn’t be any bigger. The days here start when the sun rises above the ocean. Everything is full of sand, and sunshine. Snow feels like a distant memory. Our travel here also feels like months ago. It was an adventure; transporting more than thirty people across the land, through airports: first into either Lisbon or London. We spent a night in a foreign city, exploring the pavements by streetlights and seeing the same buildings bright in the morning. Those in London flew to Portugal and met the rest of the group the following day. From Portugal, our flight went to Salvador, and we arrived there late in the evening. Another six hours in buses followed. For the last leg of our journey, we moved into smaller jeeps, and bumped across a road lined with palm trees to the beach. After 48 hours spent in in-between spaces, we had finally come to Piracanga. Upon arriving, we were warmly welcomed (not only by the hit of the sun on our Swedish beings). Yet even before breakfast, most of the yippies sprinted across the foreign paths into the river, to the ocean. The days that followed our initial arrival were for some a dream, and for some an immediate new reality. The sea became an essential part of our days, and new habits quickly developed into ways of life. Many are already at home here, and others are still landing. It’s been beautiful, and very overwhelming at times. Our circles are now formed by more than sixty people. Our small community has been taken into a much larger one, filled with spiritual energy, music, and small monkeys that look cute, but steal your bananas when you look the other way. As in Ytterjärna, times passes differently here. It’s only been three weeks, and already shifts are happening and being integrated. The rest of our months here will feel like a lifetime. A lifetime made of new stories, clear starry skies, and a wild ocean. Since I was really young and going to school and questioning reality around me, I have always believed big change was about to happen on planet earth. Something that I have always been sure of in my heart is that I have a mission for peace. I wasn’t always certain, but I had the feeling of not being alone in this mission. So now we as humanity are passing through a lot of intense experiences of life in different parts of the world, and one thing we have in common is the will to start creating new possibilities, practices and ways of connecting. Now in this current moment we as young people have the opportunity to experience an exchange program between two alternative (or futuristic) universities that are coming together in one purpose: gathering for building a better future starting now and simple; healing our relationships, taking care of nature and being aware of what kind of planet we want to leave to our children. This exchange between YIP (Youth Initiative Program) from Sweden and UNI (Universidade Viva Inkiri) from Bahia, Brazil is making me realize how important it is to meet people from all around the world (Brazil, Sweden, United States of America, Mexico, New Zealand, India, Germany, Norway, Denmark, Slovakia and more), and in this way I feel complete, and that my mission is being fulfilled, because it is worldwide and not only for one type of people or one kind of culture, but the program fits for all humanity. What I am learning here is to always be with an open heart for diversity and learning new skills. In forms of group interaction, listening and expressing ideas and feelings and creating personal or collective projects to support each other. Now in the present moment we are integrating as a community, establishing agreements for co-living, learning how to cook, clean, organize money- living together in general as well as knowing ourselves, respecting and accepting each other, making true friends and strongly bonding. In this path the probability of stopping the war is higher, because if I have a friend in every corner of the world, how could I ever hurt them?! No, I just want to be in peace with all of them. This relocation to Piracanga, Brazil, has been an intense shift. Us Yippies have gone through all sorts of individual and collective processes and reflections. Some have been challenged by so many diverse factors and some have had their hearts filled by these same factors, a continuous reminder of how diverse YIP truly is, how diverse Uni is and that the world is also greatly diversified. Questions arise. How may we, diverse citizens of this world, work and serve consciously together for greater peace and prosperity? How may we move towards clarity and embodying of our higher aspirations and purpose? Which steps can we take now? In this empowering and intense Art of Hosting week we dove into questions like these. And we did it in so many different levels! We talked about how to craft powerful questions, and we did. We practiced methodologies like Open Space, World Cafe, Graphic Recording and so many others, where some of the YIPUNI’s stepped up to host these processes, experiencing first hand what it means to create a space and host people with innovative technologies that work towards drawing out the collective intelligence and harvesting it. On top of all this, this course was facilitated by amazing contributors, that gave several gems of their experience and practice. We all were mesmerized by Toke’s presence and wisdom. His words called us and helped us stepping closer or further into action. Conscious action. I finish this week with a full heart and tool box. I’m sure these practices and skills will be present and cherished in future human cooperations that I work with. As we transition from Art of Hosting into our Open Master’s course, we turn our new harvesting, hosting and co-creating practices towards the process of designing our own learning journeys. This week’s contributors, Sarah Bradley and Alan Webb, are guiding us into the Open Master’s community of learners taking ownership of their education through self-declared master’s degrees. 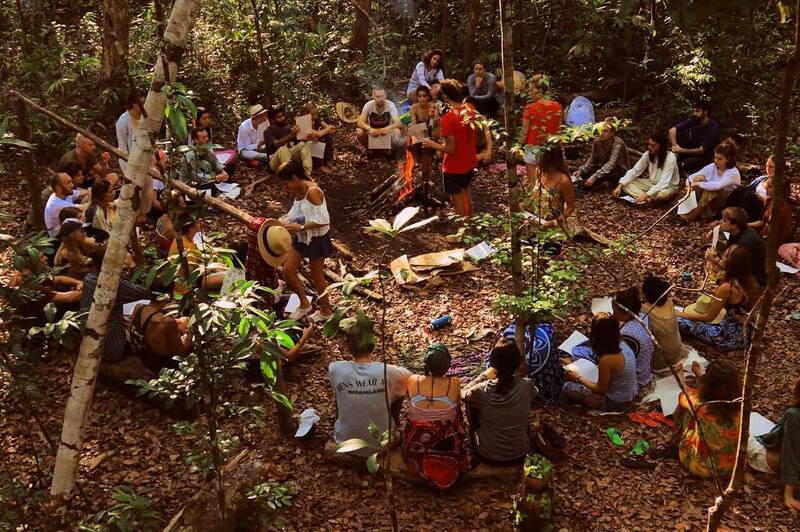 Each of us, as participants, carry the awareness that we’ve created space in our lives this year to take part in the empowering alternative education programs of YIP and Universidade Viva Inkiri. Learning about the foundation of Open Master’s recalls for us the principles of accountability, humanity, intentionality, courage and self-organization. For this particular group of students, our ears certainly perk up at the opportunity to carry and sustain our meaningful learning journeys far beyond when these programs end. We’ve only experienced the first day of the five-day course so far, which gave us room to share and explore our relationships to consumer education. As well, we established common agreements for what a welcoming and energized learning environment means to us, which as we’ve learned is an effective tool for allowing clarity and healthy coexistence to emerge. Looking ahead to later in the week, we’re excited to get some hands-on practice in designing and executing short-term, self-directed, community-supported education for ourselves. We are very very very very excited to be joined by Roi Gal-Or and Eloah Ramalho for Storytelling week! We love listening to stories with open hearts and imaginations. We look forward to learning from Roi’s unique experiences with storytelling as a tool for peace and reconciliation, and to really think about the meaning behind stories so as to understand the storytellers. We can feel that sharing stories as the YIPUNI group will be a gratifying and fun experience to have as the last course of 2017 before diving into the Summer Break (yes, it is summer here in Brazil!!). As many of you have read in your inbox, YIP is inviting a gathering of all involved in creating, facilitating, attending and contributing to the first 10 years of the programs existence. This event will not be actively advertised as we will likely fill the Kulturhuset anyway, but this does not mean it is a closed event either. So if you feel called and part of YIP’s past or future, please get in touch. In the coming newsletters we invite a couple of the voices from alumni, organizers and contributors to share their questions and anticipations in relation to the gathering as a way to start our thinking and warm up some topics and interests. In the beginning the task was clear: find 40 willing young people from all around the world; find a place that could host 40 young people’s will from all around the world; puzzle nearly a year’s worth of relevant content and experience neatly into a full-time curriculum and find the contributors; artists, storytellers, farmers, economists and politicians, sculptors of social renewal, social justice, and social entrepreneurship to bring forward the trials and triumphs of modernity with engaging, affirming and inspiring tact; then all that was left to do was sit back and watch the unfolding – simple. Well, not super simple it turns out, but this new organization of humans, The International Youth Initiative Program, forged ahead. Now, nearly 10 years later, we stand, spread the world over and yet connected by this brave undertaking. And in ten years worth of sunsets and tides, things have changed. So, what’s next? What are the new questions? What is the new urgency? And what, if we’re willing, can we accomplish together? Wherever we are and no matter what we are doing, we are all part of this community. 300 unique participants and alumnae, spread over 6 continents and connected through shared experience and common cause, with hundreds more contributors, mentors, friends and family walking together. What purpose is this diverse community currently willing to serve and how can we move toward it? Consider joining the 10-year anniversary gathering in Järna, 1-5 August 2018, to revisit the old grounds, meet one another again or for the first time, and so we may bring together our questions, ideas and visions for the future. Wishing you all a happy new year – See you in 2018!